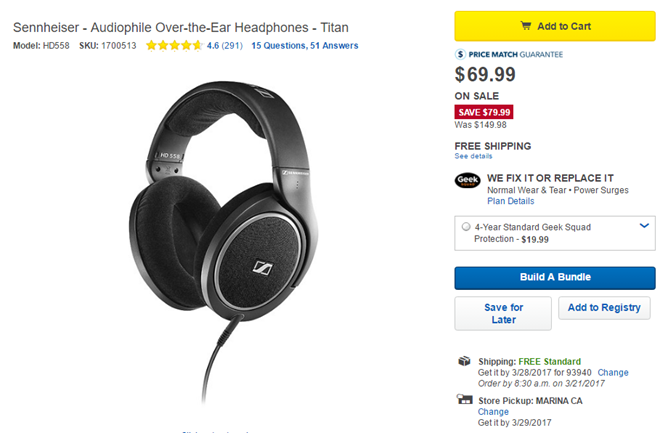 If you're still rocking a phone with a dedicated headphone jack (you antiquated philistine, you) or just using an adapter, Best Buy has a great deal on a solid pair of audiophile-grade headphones. The retailer is offering the Sennheiser HD558, a common midrange pick for stereo hi-fi fans, for just $69.99. That's eighty bucks off Best Buy's retail price, which is actually below some of its competitors' street prices already. This is a Daily Deal, so it's good for today (March 20th) only. The Sennheiser HD558 is a standard headphone design, no Bluetooth and no microphone, so while it's not the most flexible set of cans on the block it will work with just about anything. (Except those new phones without a headphone jack, natch.) The design uses big, around-the-ear cups coupled with a low 50-ohm impedance rating - that means they'll sound loud and clear even with the typically low levels of sound amplification from a phone or laptop. These cans are on the larger side, and the cable needs an included adaptor to go from its full-sized 6.35mm plug to a standard headphone jack, so they're not ideal if portability is what you're looking for. But anyone who wants some serious audio quality on a budget should check them out; the model seems to be near its end of production, so this daily deal might be one of your last chances to get the HD558 in a new package. Shipping from Best Buy is free, or you can pick it up at a local store.